Now that Namu is taking a break from serving lunch, to focus on opening a new deli at Balboa and 3rd, their outpost in the park, Happy Belly, has been receiving lots more visits from yours truly. 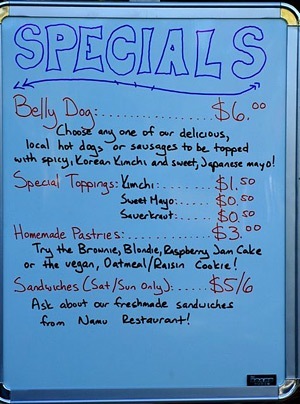 The next time you’re strolling from the Conservatory over to the DeYoung or taking a break from Lindy in the Park, stop at this modest little hot dog cart and read the menu carefully. The three Lees — David, Daniel, and David — have transferred their Korean and Japanese sensibilities from much-loved Namu to the humble hot dog. Yes, it is most definitely worth the 6 bucks plus some to enjoy homemade kimchi relish and Japanese Kewpie mayo on a spicy dog. 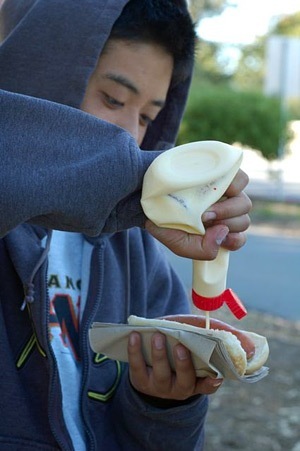 There are many reasons why San Francisco does not appear on the list of the Top Ten Hot Dog Consuming Cities. Fortunately, we have the likes of Happy Belly along with Rosamunde and What’s Up Dog, Sausage Party! in Mission Dolores Park and even Charles Phan’s new café at the Academy of Sciences, all fighting the good fight. California Retail Food Code (Cal Code) passed in 2007 includes much more stringent requirements for individual food cart owners, including a commissary for preparing the food and larger, more expensive carts. It’s always been difficult to balance the public safety of hungry, curious foodies with the need to encourage microenterprise ventures. More recently, with the increased regulations for taco trucks and food cart vendors, there are even fewer options for small food business owners to thrive and grow within a wide range of opportunities. 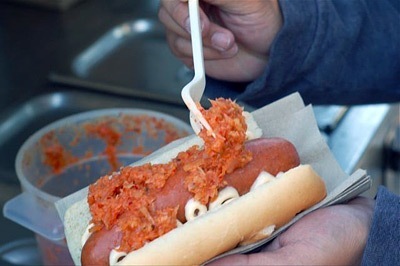 It’s become such a challenge in California, where new immigrants and intrepid foodies rubs shoulders and interests, that hot dog cart sellers have taken it upon themselves to offer free help with the health department and to translate the Cal Code into plain English (we’re still waiting for the Spanish, Vietnamese and Chinese versions). Happy Belly has the backing, facilities, and full resources of its restaurant partners, as do many of vendors at our larger farmers markets, but the individual vendors have a much tougher go of making a living from our food dollars. A truly food loving city needs to support the full range of food businesses. While we don’t want pigeon poop in our suadero tacos or listeria in our banh mi, San Francisco and all its citizens are only the poorer when we offer more restrictions than support for micro-enterprises. It’s just as important to support the little cart as your local neighborhood café or downtown’s fine-dining establishments. Remember that local food includes the corner carts, so be proud to support everyone in the culinary spectrum. Southwest corner of J.F. Kennedy Dr. and Tea Garden Dr.